I recently installed some 4.56 gears in my 8.25. Having found it to be slightly different from the typical Dana axles, and not being able to find a real write-up on this axle easily, and at the request of a few people on the forum, I figured I'd write up a tip sheet or something. I am by no means an expert gear installer, this was my first time doing gears even. It is very likely I'll leave out a few steps. And I don't know many of the technical terms, so expect dohickey and thing-a-ma-bob to be used alot. As a result, do not hold me liable to anything said here. With that out of the way, I will try to get some stuff clarified. Remove the diff cover. 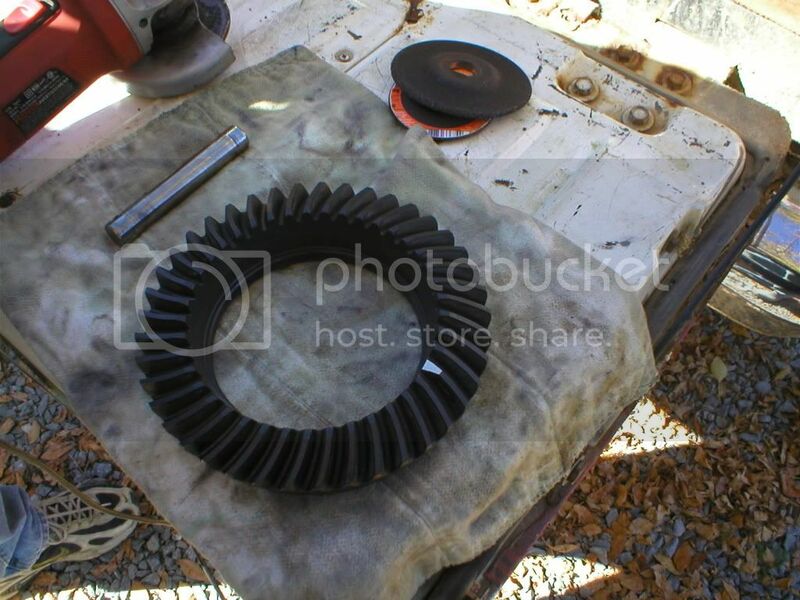 I suggest placing a pan under the diff that can hold 2 quarts of gear oil. Starting at the bottom, undo the bolts evenly towards the top. If the oil has not started to drain by the time you get to the top bolt, loosen it but do not remove it and take a screwdriver and gently pry it off from the bottom. Let the oil drain, then remove the top bolt. Edited - Step 2.) Remove the retaining clips holding the adjusters in place. 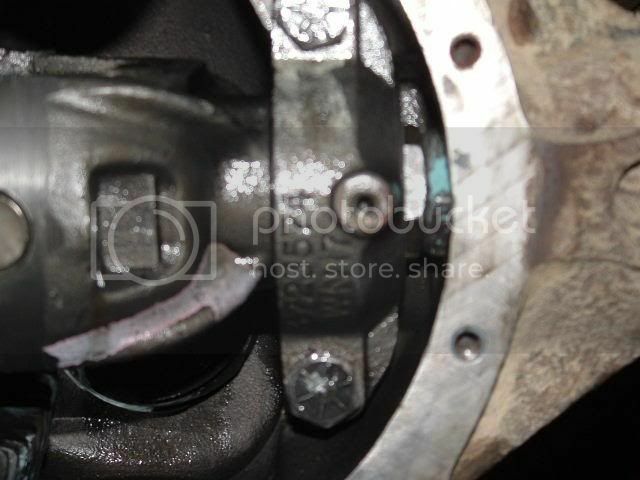 A picture of the bearing cap, adjuster and adjuster clip courtesy of XJ99. Remove the center pin. There is a bolt holding it in on one side of the carrier. 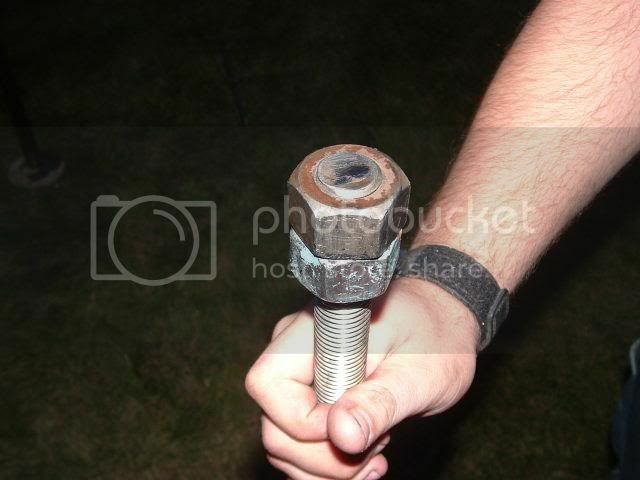 I believe it is a 5/16ths bolt. Be very careful, I rounded it over when I tried taking it out. Could ruin the day right there. Proceed to remove the axle shafts now. You will need to push in on each one individually so you can remove the c-clips as they are held in place by the side gears. After the c-clip is removed, the axle shaft should slide out of the axle. Be careful the spider gears don't fall out, and put the center pin back into the carrier after the axles are removed. Remove the two blocks retaining the carrier bearings, one of which is pictured in the above picture. Make sure to mark them as need to go back on the same way they came off. The carrier should fall out at this point, so be prepared to catch it. If it doesn't just fall out you can run a rag through the gears and it will force them out. You can remove the old bearings off of the carrier at this point. Basically, it's a piece of angle iron with a semicircle cut through it and two holes. The two holes line up with the holes on the yoke and the semicircle lets you put the socket onto the nut. It will rest against the ground and prevent the yoke from moving while you take the nut off. Once the pinion is out, note the assembly of the bearings and shims, in addition to shim size. You will want to use this information later. Now that the pinion nut is off, you gotta get the yoke off and the pinion out. The yoke should just slide off. The pinion will be press-fit in though and requires a large hammer and a block of wood. Have at it. Once they are out, you will have to remove the races for the bearings if you are not reusing them. It will require a punch and a hammer. At this point, unless I forgot something, the entire diff should be empty. Clean it liberally with some brake cleaner (non-chlorinated kind if you like having normal kids in the future) and some paper shop towels. Remove the ring gear from the carrier. Unless you have some form of vise in which you can grab the carrier well, it will probably require two people. We used two socket wrenches and put a person on each one, pushing on opposite sides of the carrier to break the bolts free. You can reassemble the new ring gear onto the carrier at this point. Depending on the gears you go with they may be too tall to allow the center pin to go back into the carrier. What I did was grind down one tooth on the ring gear in front of the hole in the carrier, and grind down the bottom of the center pin. These won't affect the overall strength of the gear set too much because the area of the gear tooth being used shouldn't be infringed upon by the grinding. Be sure to use lock-tight on any bolts you put back into the carrier. Assemble the new races back in the axle. This will require careful hammering and a punch that will cover the face of the races so you don't damage them. It's a fairly idiot proof process as long as you make sure they go in straight. Last edited by mbood82; 08-29-2009 at 06:35 AM. At this point the pinion has to go back in. It is recommended to start with the same size shim as what was removed originally, as 90% of the time it will remain the same. It didn't for me, but thats how the cookie crumbles. I'd recommend using the old bearings for test fitting until you are sure of the shim size. I had to assemble my pinion twice before we hit on the correct shim size. The correct procedure (if I recall correctly) for checking for proper shim size is to install the new pinion with the old bearings and crush sleeve so that the pinion is tight, and then measure the backlash and pattern markings with the carrier put in temporarily. If you were make setup bearings by taking a dremel and grind out the inside of the old bearing a bit so it will slide down the pinion easier it makes it alot easier to test fit. Now you are ready to put the pinion in for good. Put your new bearings, shims, and crush sleeve into the diff. Using your yoke wrench again and the socket wrench, tighten the pinion nut down until there is no play in the pinion back and forth. Only tighten it up to that point, you don't want to over crush the crush sleeve yet. Now you will need to get out your inch-pound torque wrench and see how much preload is on the bearings. I believe we aimed for around 12 in-pounds. If it is below that still, slowly tighten up the nut until you get there. To adjust the backlash, you will need to turn both adjusters until they are tight. You don't need to reef on it too much we found, but good and snug is appropriate. The two bolts holding each brace on will need to be loose for the adjusters to be able to be adjusted. Be sure to tighten them up though before checking backlash, we found that out the hardway after the first half hour of setting it up. Be sure to use some thread locker on the bolts after your final adjustment, and tighten them to 60 ft-lbs. Once the gears are all set, you'll want to install the clips on each brace. These will prevent the adjusters from turning too much in the diff. Now you will want to put the axles back in place. Once each one is in, you can install the c-clips and then pull the axle back flush within the spider gears. The center pin can then be put back in. Be sure to use thread locker on the bolt holding the center pin in place. At this point, you should be able to reseal the diff cover and put 2 quarts of oil in. You'll want to take it for a spin and listen for gear howl and the like. If you go with really low gears, they will probably howl anyways, at least on the coast side. It's a noisy axle. The proper break in period is, from what my research shows, to run the axle for about 15 minutes at varying speeds to warm it up, and then let it cool for a while. Do this a few times to let the gears work harden and you should be set. I hope this helps, any inaccurate info I would love to be notified on and I will change. Similarly, anything you can add that I missed or would simply be helpful I'd appreciate. Special thanks to Josh Walls, Dan Wilson, and assorted others for their expertise/manual labor help. I greatly appreciate it. Last edited by mbood82; 08-29-2009 at 06:21 AM. NICE write up, deff going into the Tech/FAQ section if you don't mind. As long as it's accurate enough, I sure don't mind. hehehe fun wasn't it? I didn't do a write when I did mine it was my first time too! Your right about the shim, I just reused the old one. If your changing the ratio you will most likely have to change the shim. It's been almost 50,000 miles since I rebuilt the rear. All in all you made one hell of a write up! Last edited by XJ99; 08-08-2005 at 03:45 PM. Update: I graduated school back in May, the pictures have been down since about then. I was recently contacted by someone asking for information on it and I figured I'd start looking for the pictures again and try to update this post. In the meantime, feel free to e-mail me at [email protected] with any questions. Pictures up, as close as I can remember at least. Added a real picture of the yoke wrench I found on the internet as compared to the Solidworks picture I had up previously. Hope it helps someone. Just a heads up for anyone working on a 8.25 axle. 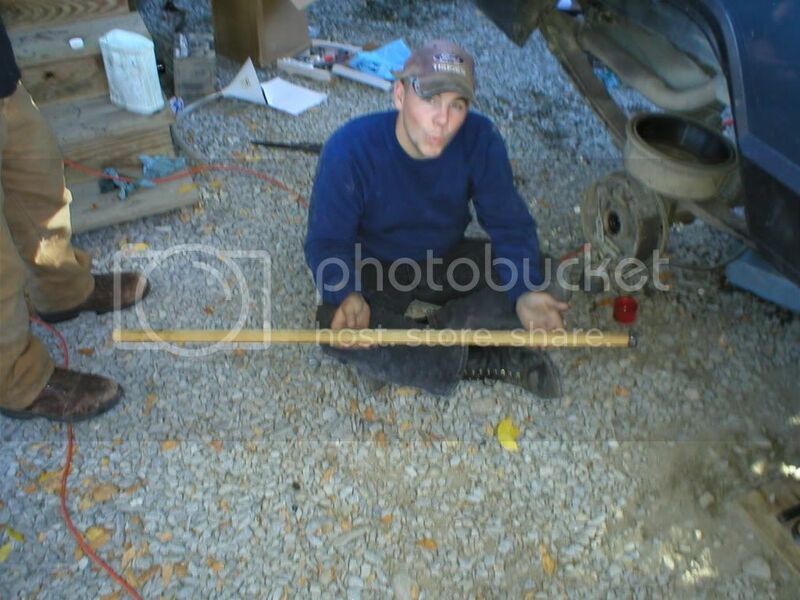 (or a 9.25 for that matter) The torsion bar from 4WD 97-00 Dakota or 98-00 Durango will fit the carrier adjusting nuts well. You should be able to find one in the junkyard for alot less then the $65 price for the actual tool. '96 XJ 4.0 AW4, 3" Homebrew lift, homebuilt tree felling bumper, warn x-case skid, roof mounted spare and hi-lift, lots of custom bent sheetmetal. From dealerconnect service manual section. Mark the gears so the same teeth are meshed during all backlash measurements. Maintain the torque while adjusting the bearing preload and ring gear backlash. Excessive adjuster torque will introduce a high bearing load and cause premature bearing failure. Insufficient adjuster torque can result in excessive differential case free-play and ring gear noise. Insufficient adjuster torque will not support the ring gear correctly and can cause excessive differential case free-play and ring gear noise. Maintain the gear teeth engaged (meshed) as marked. The bearings must be seated by rapidly rotating the pinion gear a half turn back and forth. Do this five to ten times each time the threaded adjusters are adjusted. Use Wrench C-4164 to adjust each threaded adjuster inward until the differential bearing free-play is eliminated Threaded Adjuster Tool Allow some ring gear backlash (approximately 0.01 inch/0.25 mm) between the ring and pinion gear. Seat the bearing cups with the procedure described above. Install dial indicator and position the plunger against the drive side of a ring gear tooth Ring Gear Backlash Measurement Measure the backlash at 4 positions (90 degrees apart) around the ring gear. Locate and mark the area of minimum backlash. 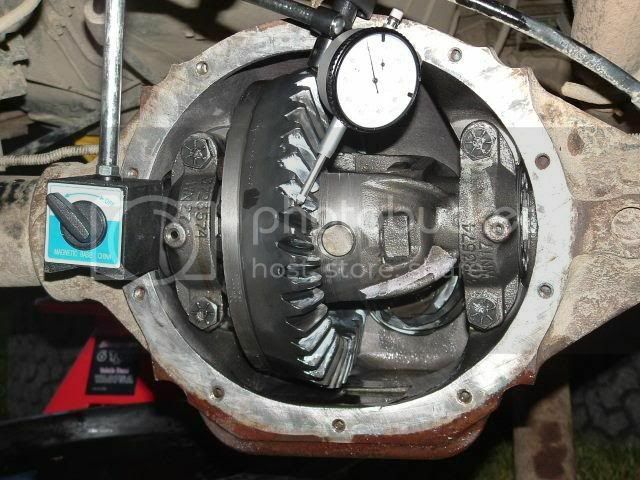 Rotate the ring gear to the position of the least backlash. Mark the gear so that all future backlash measurements will be taken with the same gear teeth meshed. Loosen the right-side, tighten the left-side threaded adjuster. Obtain backlash of 0.003 to 0.004 inch (0.076 to 0.102 mm) with each adjuster tightened to 14 N&#183;m (10 ft. lbs.) Seat the bearing cups with the procedure described above. NOTE: The left-side threaded adjuster torque should have approximately 102 N&#183;m (75 ft. lbs.) If the torque is considerably less, the complete adjustment procedure must be repeated. Tighten the left-side threaded adjuster until 102 N&#183;m (75 ft. lbs.) torque is indicated. Seat the bearing rollers with the procedure described above. Do this until the torque remains constant. After the proper backlash is achieved, perform the Gear Contact Analysis procedure. Axle TypeSemi-floating, hypoid LubricantSAE 80W-90 Lube Capacity2.08 L (4.4 pts.) Trac-Lok Additive118 ml (4 oz.) Axle Ratio3.07, 3.55,. 4.10 Differential Case Clearance0.12 mm (0.005 in.) Case Flange Runout0.076 mm (0.003 in.) Ring Gear Diameter20.95 cm (8.25 in.) Backlash0.12-0.20 mm (0.005-0.008 in.) Runout0.127 mm (0.005 in.) Pinion Bearing Preload-Used Bearings1-2 N&#183;m (10-20 in.lbs.) Preload-New Bearings1-5 N&#183;m (10-30 in.lbs. )The pinion bearing torque numbers are a turning torque. I work for a Jeep dealer as a tech. Canceled Facebook a while ago, too creepy. I've rehosted the photos on Photobucket now and tried to read through to see if there was anything I could update or correct as I've done a couple more axles since then. So do you actually hear your thoughts in your head or is it just sort of a dull roar before you smash your face into your keyboard and just submit whatever dumb **** ended up on the page? Armor: Stock metal gas tank skid and TC skid. Homebrew Rocksliders. 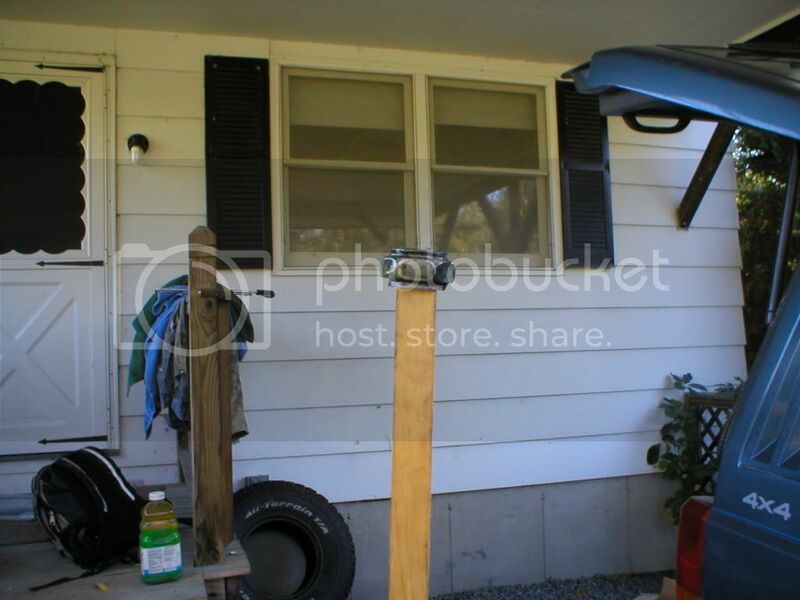 What size nut is that on the end of the home-meade tool? your guess is as good as mine, something big? I don't have the adjuster around anymore so I can't offer any help.